Loaded Dice is a co-design tool used to explore the design space of smart connected things. 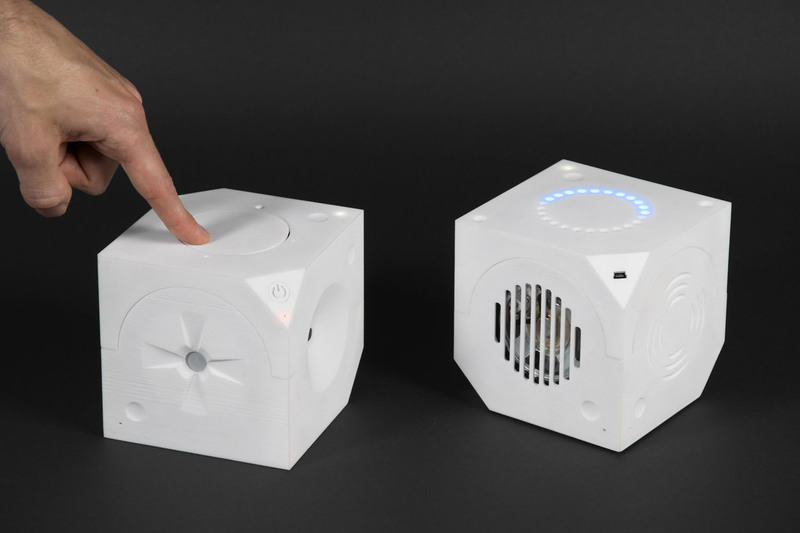 The tool consists of two Arduino-based 3D-printed cubes. One of the devices is equipped with a different sensor on each of its six sides, while the other is equipped with a different actuator on each side. Whichever side is on top is active, communicating wirelessly over distance with the top side of the other cube. Loaded Dice supports creativity, imagination, and exploration in the design process of smart and multisensory devices and services, especially in the early ideation stages. Lefeuvre, K., Totzauer, S., Bischof, A. Kurze, A., Storz, M., Ullmann, L., and Berger, A. Loaded Dice: Exploring the design space of connected devices with blind and visually impaired people. Proc. of the 9th Nordic Conference on Human-Computer Interaction. ACM, New York, 2016, Article No. 31. Lefeuvre, K., Berger, A., Kurze, A., Totzauer, S., Storz, M., and Bischof, A. Smart connected sensations: Co-creating smart connected applications through distributed serendipity. Proc. of the 9th Nordic Conference on Human-Computer Interaction. ACM, New York, 2016, Article No. 88. The sensor on the top side of one cube communicates wirelessly with the actuator on the top side of the other cube.